Little Miss Lauren and I got the opportunity to do just that on Friday night. Her Brownie troop spent the night inside the shark tunnel at the Aquarium of the Bay on Pier 39 in San Francisco. 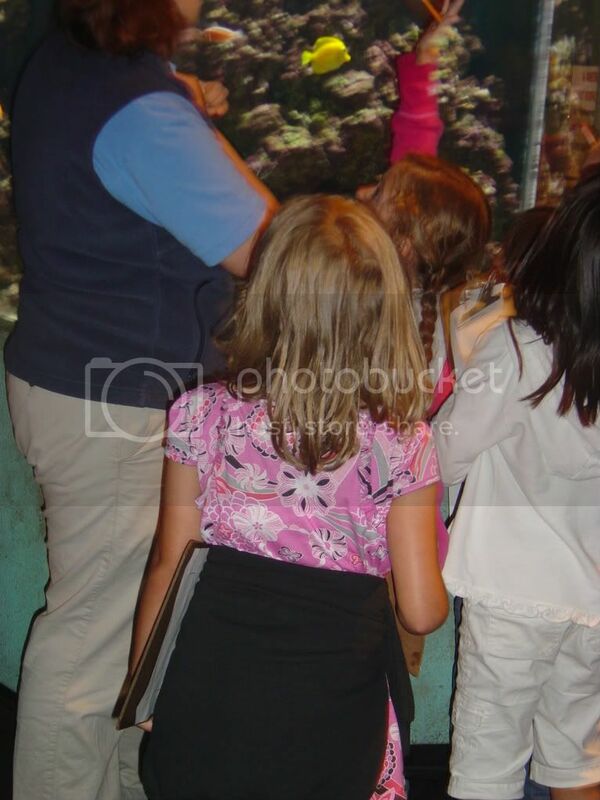 We arrived at the aquarium and beginning around 8pm the girls got an in-depth lesson about fish and how some of them have adapted to their special lives under the sea. They then had a late night snack of some very tasty pizza and then they were off with their teachers for the evening to explore the aquarium. It was pretty awesome because it was just the 11 girls and us Moms - no one to have to crowd into to see a fish, no one to stand in front of you just when a fish was doing something neat - it was great. The girls each had a worksheet and had to find one fish in each of the three sections, draw a picture of their chosen fish and then explain what their adaptation was and how it helped the fish. After we spent about 45 minutes going through the exhibits and finding our special fishes, the girls went back and shared their findings - after which they were each presented with special "Save the Bay" badges for their sashes. Around 11pm the fun began... everyone got changed into their PJ's and we went downstairs to stake our spots in either the "Fish Tunnel" or the "Shark Tunnel". 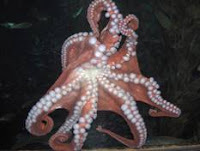 The Fish Tunnel housed a huge orange octopus and Lauren wanted no part of him, so we chose the Shark Tunne l. We picked a spot and got our sleeping bags all arranged (sorry no pj pics, we weren't allowed to take "anything with an on/off button" downstairs with us to sleep!!.. huh??). When you are first getting settled, the lights are on full-blast just like they would be for visitors in the daytime - Lauren got all settled in her sleeping bag and looked up "when do they turn the lights off? ", she asked... I told her in a little while and she proceeded to cower inside her sleeping bag waiting for the lights to go off. after about 15 minutes, they turn them down to half (to simulate dusk/dawn) and then after about 15 more minutes, they turn off completely leaving only the illuminated Green "EXIT" signs to serve as our nightlights. Lauren is still cowering, and comes up for air when the lights go off to check out her surroundings... Not acceptable in her book, the fish are still very visible. She starts whimpering and cowering and I try to calm her - she's having no part of it. After about fifteen minutes, she moves on to full-blown tears chanting "I want to go home right now... really bad". I try to find a spot outside the tunnel underneath some very peaceful jellyfish... nope - no good. A very kind mother comes over to try to help me move our paraphernalia to a new spot and we move to the opposite end of the tunnel - several feet outside... no fish around. Through her tears, Lauren declares this acceptable and we re-set our beds near the elevators and the teachers for the evening. Lauren cowers into her sleeping bag and finally calms down enough to go to sleep.... Until about 2am - she starts whimpering and breathing heavily and I can tell she's having a bad dream... the "I want to go home" chant starts again. At this point, I truly consider leaving, but Eric and Collette are about two miles away in a hotel room and his cellphone is set on vibrate - he'd never hear me calling. There was no way she and I were walking along Fisherman's Wharf at 2am hauling sleeping bags and backpacks by ourselves... so there we stayed. Lauren calmed down and finally went back to sleep (I wish I could say the same for myself)... I'd never been so happy to hear the wake-up alarm in my whole life... I wake up Lauren and get our sleeping bags put away. Lauren had been cocooned about 2 feet down in her sleeping bag all night, head covered and all and when I picked up her sleeping bag there was literally a puddle under the bag (no exxageration!) - of course my first thought is that she'd had an accident and, nope, she's just drenched with sweat... eeewww, poor thing. We get dressed, share half a chocolate muffin and head out into the crisp, foggy morning. Lauren and I walk the two miles to the hotel and take turns taking showers and becoming human again! It is at this point that I learn why she hated the tunnel so much... 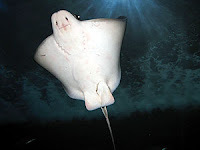 The bat-ray fish had faces underneath and they were smiling at her!... Bless her little heart!! (they actually do look like smiley faces - but it never occurred to me they'd be scary). So, it is with great exhaustion that I can cross this off from my list of things we must do this summer and chalk the whole thing up to experience. We're none the worse for a lost night of sleep (well, nothing some Advil can't help anyway) and she did have fun during every other part of the evening. If it just wasn't for those darned smiling bat-rays!!! P.S. The opportunity to do this is usually only open to groups (girl scouts, schools, etc), but at the end of July, this opportunity will be open to families. I'm sure your kids won't have the same aversion to a smiling, happy bat-ray that Lauren did, so if you plan to be in the San Francisco area July 26th and 27th, check out their website at Aquarium of the Bay for details on how to make reservations! (It really was cool.. sans the crying episodes). Wow, sounds like an adventure. I would have thought it was a chance of a life time, I would have NEVER thought the fear would come, especially with mom there. Sometimes, I forget what an imagination they can have... It's true, they creep me out too, because of the smililng face... lol..
Those are some scary looking fish, it almost doesn't look real. It sounds like a great time other than that. How cool that they allowed the sleepover.